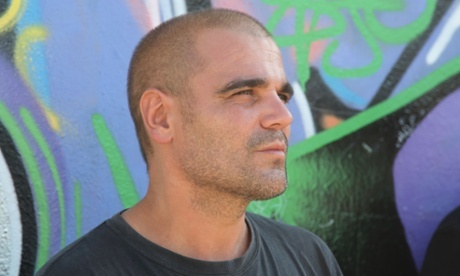 As the state has withdrawn, Santiago Cirugeda has stepped in to turn abandoned sites in Seville and other Spanish cities into dramatic art spaces that are inspiring a new breed of architect. In June 2014, Santiago Cirugeda and Jorge “Bifu” Barroso announced the closure of La Carpa (the big top) in downtown Seville. It had been four years since the radical architect and theatre director had teamed up to assemble the city’s first self-built independent arts space by occupying a disused piece of public land. 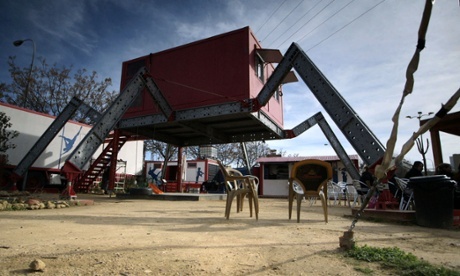 And so the structures that made up La Carpa – by now, a popular fixture in the city, with its own circus group – were dutifully taken down: two second-hand circus tents, a two-storey building made from shipping containers, a skate ramp, and the iconic araña – another container, this one mounted on four, half-bent metal legs like a post-nuclear spider (certainly not your average office space). The occupation allowed them to gain a preliminary land concession from authorities, and from there, La Carpa began to grow. By the time it closed, Barroso estimates tens of thousands had attended concerts, theatre performances, live music and workshops there. The backdrop to Cirugeda’s work is Spain’s economic crisis, during which 500,000 half-built properties have been abandoned, while hundreds of thousands of Spaniards unable to pay their mortgages have been evicted from their homes under draconian repossession laws. In one of his first experiments, Cirugeda applied for a standard skip license. There was a house nearby undergoing works, so the permit was granted. But Cirugeda wasn’t intending to actually hire a skip to dump rubbish. Instead, he built his own, complete with the standard orange and white stripes but topped with wooden boards – and a centrally mounted seesaw. He called it “a self-built and self-managed urban playground”, and it proved hugely popular with the younger residents of the Alameda, the former red-light district where he lives and works. Guerrilla Architect, the first in Al Jazeera English’s Rebel Architecture series. Within a few days however, a neighbour had complained about the strange structure, and Cirugeda was summoned to the local police station. The planning authorities, however, were forced to concede that he had met all of the legal requirements; he had requested a license, the skip was clearly marked and it didn’t obstruct the traffic or pedestrians. There were no other legal grounds on which to challenge the installation, so the project continued, moving to different locations around Seville, reappearing with a swing, as a small flamenco stage and as a theatre set for a group of local kids. Later, for another project, he knocked down the walls around plots of unoccupied municipal land and reused the swings and seesaws to create itinerant play parks – all this in a city that had only one public playground at the time. In austerity-stricken Spain, Ciruegada is by no means alone in advocating collective self-build projects. As well as Alice Attout – his partner and fellow architect – Recetas Urbanas counts on a support network of dozens of so-called “collective architects” all over the country (La red de arquitecturas colectivas). Its members work on different projects across Spain, but in recent years they have also started to collaborate on self-build projects, helping social or activist groups by joining forces and resources. 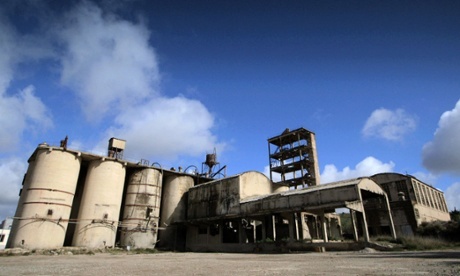 An abandoned cement factory in the south-western city of Badajoz, where a local collective is being helped by architects from across Spain on their self-build project. The Fábrica de Toda La Vida – on the site of an abandoned, Franco-era cement factory in the south-western city of Badajoz – is one such project. When a group of local artists and graduates wanted to turn the factory’s derelict warehouses into artists’ studios, they turned to Cirugeda. Recetas Urbanas made the case to local authorities that by propping up the crumbling factory roof, they were saving a piece of heritage. It was an argument that convinced authorities to grant the collective a temporary concession to the warehouses. Interview with Santiago Cirugeda, director of the Recetas Urbanas practice. Certainly, the acute years of the crisis have allowed activist groups and collective practices to come into their own, seizing the space left by the rapidly retreating state and taking advantage of its inability to intervene. Self-build projects and occupations are occurring all over Spain. But assuming this space on the margins of the law and of the state has its price. “I rent an old house that used to be a brothel, I drive a second-hand van, and apart from that I don’t own anything at all,” Cirugeda says. “There’s no money in this.